Romance shouldn’t be relegated to one night or even one month a year. 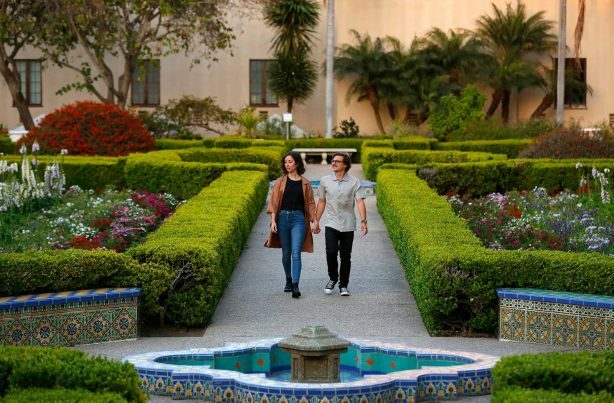 The good news is that there is no shortage of unique romantic outings for you and your partner in Balboa Park all year round. Whether its learning how to cha-cha-cha, hiking off the beaten path or picnicking at your pleasure, Balboa Park is where the city’s cultural heart takes flight. There is no more romantic notion than that of expertly whirling your date around the dance floor to the delight of onlookers – not to mention your partner. Granted that flight of fancy footwork is easier said than done. If you are looking for a way to take one, or two, steps closer to dance floor, look no more. The Balboa Park Dancers offer classes on Friday nights (7:30 PM and 8:20 PM) and Sunday nights (7:00 PM and 7:50 PM) at the Balboa Park Club. They are open to any skill level. And the cost is $6 for non-members and $4 for members – so you won’t break the bank even as you break out into a foxtrot. After you’ve tripped the light fantastic together, it’s a quick walk to either Panama 66 or the Prado. Treat your dance partner to a craft beer or craft cocktail while admiring the beautifully lit buildings of Balboa Park. For whatever reason, picnics are one of the romance’s most consistent plays. A wicker basket, a plaid blanket, a little wine, and, voila, you have hit a hat trick of the heart. Now if you add in a garden and a gorgeous backdrop of eye-popping architecture, well, your significant other will no doubt swoon. The good news Balboa Park is designed for picnics a plenty with any number of picturesque places. If wine (or some other type of adult beverage) is on your menu, however, the best places to head are either the East Lawn or West Lawn right in front of the Botanical Building and near the storied Lily Pond. While BYOB is A-OK here between noon and 8:00 PM, glass is never allowed so plan accordingly. If planning is not your passion or predilection, you can always find your way to Panama 66. They have picnic blankets behind the bar that you can use in the May S. Macy Sculpture Garden so you can sip a drink while taking in the sights, which includes not only sculptures but also the iconic California Tower. If your date has a love for the great outdoors, there’s no reason to make a long trek outside the city to get your hike on. Balboa Park has more than 65 miles of trails! And some of them go through areas that harken back to San Diego’s beginnings with native plants and unspoiled topography. For a more rugged walk, a great starting point is at the Morley Field Gateway on the East Mesa. There you will find a 2.4-mile mostly dirt trail that goes through not-often-seen natural areas of Balboa Park. Follow No. 12 green trail markers and be prepared for some elevation changes. If you want to bolster your Balboa Park cred further, consider taking a quick drive to Tobey’s 19th Hole Cafe at the Balboa Park Golf Course for a restorative post-hike drink. Now, the downhome décor might not scream romance, but the view from the patio of downtown San Diego and the golf course is one that your date won’t soon forget. No doubt art inspires all sorts of emotions. It also can make you look like a thoughtful, cultured sort of person. So, if you are aiming to impress and inspire amour, a bit of ambling through Balboa Park’s art museums might be just what you are looking for in a date. The Timken Museum of Art, known as the jewel box of the park, provides an intimate and accessible experience – not to mention a free one. The iconic mid-century modern building houses the Putnam Foundation’s globally important collection of European old masters, 19th century American art and Russian icons. Right next door is the San Diego Museum of Art, which, too, has a nationally renowned collections and features works by such well-known artists as Henri Matisse, Claude Monet, Georgia O’Keeffe, and Diego Rivera. A leisurely stroll through a garden is just one way to make love bloom. And, of course, Balboa Park has a variety gardens to explore. One obvious choice is the Inez Grant Parker Memorial Rose Garden on Park Avenue. The three-acre garden is home to some 1,600 roses with more than 130 varieties. The seeing and sniffing season runs from March through December. The roses usually at their peak in April and May. Want something a little less floral? The adjacent Desert Garden contains more than 1,300 plants, including succulents, drought-resistant plants, and cacti from around the world. The candelabra cactus is a can’t-miss and an Instagram-worthy backdrop for sure. While most of Balboa Park’s gardens are free, the Japanese Friendship Garden has a $12 entrance fee for adults, but it is well worth the price. The 12-acre garden is filled with beautiful black pine trees, azaleas and ornamental plants such as camellias, magnolia, wisteria and cherry blossom trees. Looking for a moment of Zen with your make? Make sure to check out the newly installed 12-foot bronze Kannon Botasu statue from 1735. This entry was posted in Attractions by Jennifer Davies. Bookmark the permalink.